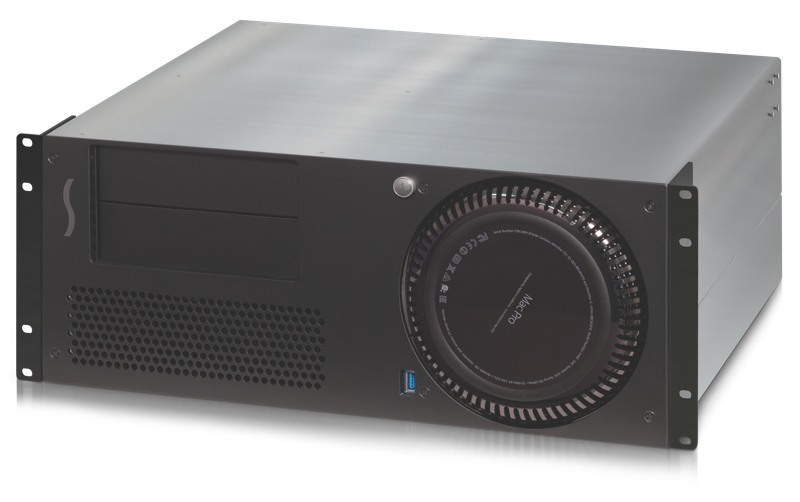 Sonnet has announced a 4U rackmount enclosure and expansion chassis for the new Mac Pro, allowing users to horizontally mount their Mac Pro in a standard data center rack with PCIe expansion capabilities. The xMac Pro Server includes three PCIe single-width expansion slots, with room for one double-width and one single-width card, Thunderbolt 2 compatibility, and a mounting kit for additional storage or optical drives. On the back, the rack includes three USB 3.0 ports, two Gigabit Ethernet ports, and an HDMI port, with a single USB 3.0 port on the front. It includes a 300W power supply and a 75W PCIe power connector for supplemental power to certain power-hungry PCIe cards. The new Mac Pro has become the object of desire, but a lustrous finish hides its true beauty—the massive power within. If you're a pro user in the video or audio industries, the Mac Pro offers the power you need, but lacks the built-in expandability you count on. In order to achieve this engineering feat, Apple® designers stripped away components and space to a minimum, taking out PCIe slots and drive bays, and packed the remaining components into a small cylinder. Its compact size makes the new Mac Pro more transportable and rackable, but prevents onboard installation of PCIe expansion cards. In addition, the computer still requires an enclosure to make it road- or rack-ready and provide convenient cable management. Sonnet's xMac Pro Server PCIe expansion system/4U rackmount enclosure addresses these issues and increases a Mac Pro's potential in a big way. Sonnet claims the xMac Pro Server will ship in early June, offering a sign-up sheet for interested customers on its website. It has a suggested price of $1,499. The company announced Thunderbolt docking stations nearly a year ago but has delayed shipment several times. Update 12:35PM 3/27/2014: Pricing information added. Heres to the crazy ones. The misfits. The rebels. The troublemakers. The round pegs in the square holes. or just buy a real server. it would be cheaper. Can't wait to see this in 2018! But did they have to make it this ugly? Really, what a shame. Ugly?!? What are you talking about? Who cares, it's rack mounted! Server racks aren't things people have on display - they are space preservative mounts to house multiple devices stacked. This Mac Pro rack mount will be very useful for studios. Really Sonnet? Were customers really asking for this? Sonnet, How about shipping the Echo 15 Thunderbolt Dock that you announced a year ago. Can't help but wonder what effect the horizontal configuration of the nMP will have on thermal control. It seems to me optimal cooling comes in the vertical position. I wonder if buyers of this rack will have heating issues. Your post is a good example why Apple no longer makes servers. Apple fanatics don't really know or understand what a server does - nor do they care. They just want an "elegant, magical, and delicious" case that "Jony" designs for them! I would probably pass this one and assume it ran XP.